We walked into the restaurant for a good friend’s birthday dinner a few years back and right away we noticed there was something odd about this steakhouse. Smoke rising from steaks searing on an open grill was, of course, expected. But as we moved further into the dining room the smell of those steaks actually seemed to be emanating from rather close by…like they were being grilled right there in the dining room. Oh my goodness, by the restaurant patrons themselves! If you haven’t been to one of those do-it-yourself grill places (there are a few here in San Diego), it can be a fun social experience with a group. Especially with a group of inexperienced grillers. At the time of this party, my husband and I were abysmally bad at grilling. I don’t think we even owned a barbecue at that point. We could execute a decent burger… beyond that was uncharted territory. Suffice it to say, we enjoyed a lot of side dishes at that party! These days I’m proud to say I’m a confident griller. I fire up the barbecue nearly every weekend in the summer and lately I’ve been able to manage one weeknight grilled meal as well. 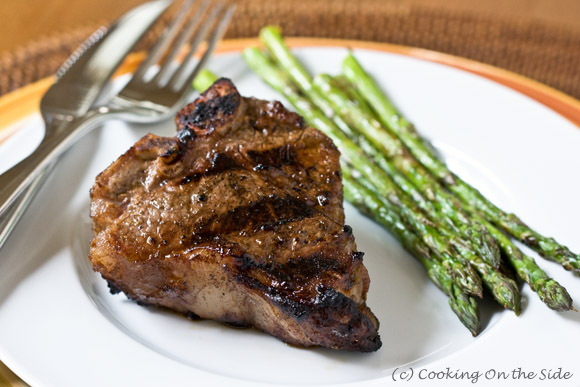 Today’s Balsamic Marinated Lamb Chops are perfect for a weeknight. It takes just minutes to assemble the marinade, which is a fabulous combination of savory and tangy flavors. Let the lamb bathe in those flavors overnight, then just grill them off in under 15 minutes for dinner. Toss some asparagus in olive oil, salt and lemon pepper and roll them on the grates for a few minutes while the meat is resting and you’ve got a meal! Mix all ingredients except lamb chops. Place the chops in a large resealable plastic bag with the marinade and refrigerate for up to 24 hours. Remove the chops from the plastic bag and discard the remaining marinade. Broil or grill 4-6 inches from the source of heat for about six minutes per side or until desired doneness. (I grilled 7 minutes per side on a gas grill over medium-high heat for medium doneness). Allow the meat to rest for 5-10 minutes before serving. I haven’t been to one of those grill-it-yourself places, unless you count Korean barbecue restaurants. Sounds like fun! This recipe sounds as though it’s packed with flavor. Man you make that sound easy! 🙂 I *think* I’ve only had lamb once and couldn’t get over how tasty it was! It’s definitely not the typical go to meat option for most. I know what you mean. We’ve really gotten into lamb in the past year, it’s pretty wonderful and something a little different every now and then. 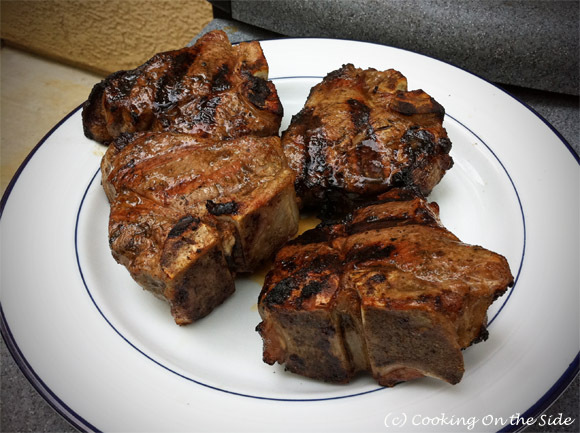 I adore lamb chops–these look wonderful. But these lamb chops sounds so good and perfect for a summer grill out! This looks SO good! I love balsamic but never thought to combine it with grilling. Tried this tonight! SO GOOD!! I didn’t know there were restaurants where you grilled your own steak. Now I’m going to have to do some research for L.A. I love your photos, by the way. I also gave your blog an award, so please stop by my blog to accept it. Thanks. This was delicious! I made this for dinner tonight and I loved it. Unfortunately my mom’s not a fan of lamb, but hey, more for me! Thanks for sharing! I am a huge lamb fan but I am not sure if I would be willing to show my grillin’ in front of everyone, knowing my luck I would burn the house down. I know this seems a little off topic but what kind of camera are you using to get such fantastic shots of your meal? It looks so amazing, and it’s more than just the great recipe. Made these chops for 10 and they were fabulous served with calcannon potatoes and grilled asparagus with champagne mustard and olive oil! The meal sounds wonderful, Rosanne! Next post: Overnight Belgian Waffles + a Waffle Skillet Giveaway!